Norman is a young child whose mother is an architect. Like anybody his age, Norman is impatient, so much so that instead of waiting for his mother to take him on "an adventure," he heads out for his own adventure ― all alone. Or so it seems. 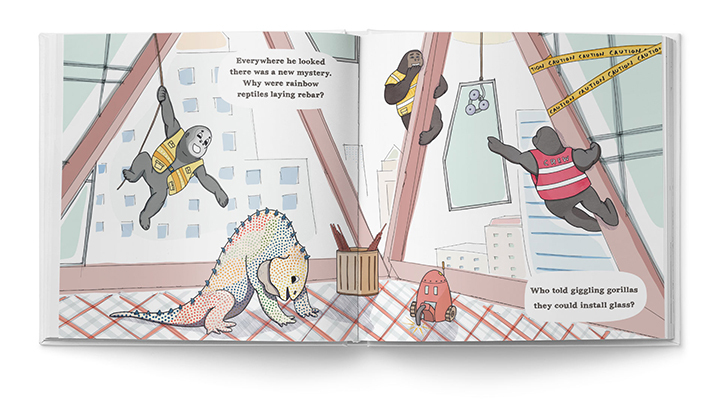 As Norman wanders about a construction site, the workers are anything but human: an architect (not his mother but clearly an architect given the suit and roll of drawings) is a robot, ironworkers are "giggling gorillas," painters are "pompous penguins." They are hints that something else, something imaginative is going on. 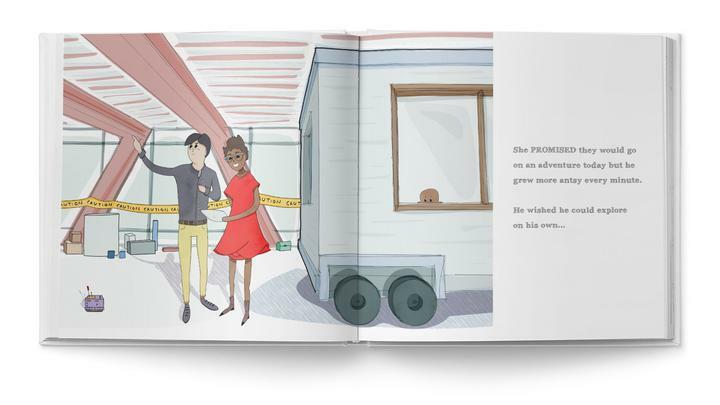 What that is I won't say here, even as it's unlikely that the intended audience for this picture book ― the kids whose parents would read it to them before bed ― would read this blog. The setting for Norman's adventure may be decipherable by the cover and the couple spreads included here. The glass and steel building with diagonal bracing is Norman Foster's Hearst Tower in New York City. When Foster's tower was completed a decade ago, I was not a fan; I called it one of the ugliest buildings in New York because it was an insensitive addition to the 1928 stone base and it was far less elegant than most Foster buildings before it, particularly in regard to the oversized diagonals. In the ensuing years I've warmed up to the tower, realizing how the thickened diagonal lines allow the building to stand out as buildings along 57th Street tower over it; and I got to go on my own adventure inside the building with some friends, seeing the atrium and office floors firsthand on a tour. 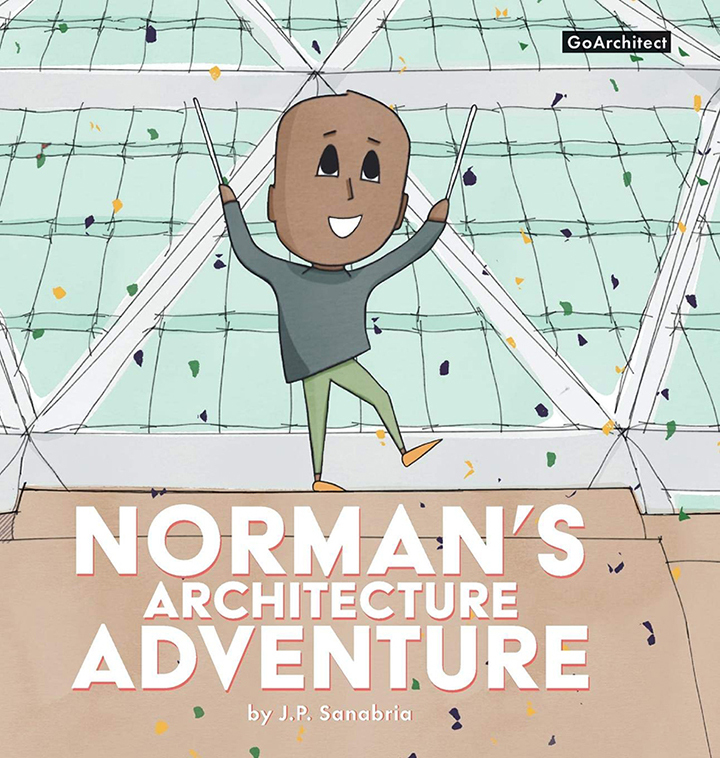 My point here is that I can sympathize with the author's decision to have Norman play in and around Hearst Tower; its atrium teases at people who enter the lobby, while the diagonals and "bird beaks" on the exterior make passersby wonder what it's like to work inside the tower. But of course writing this commentary makes me wonder, which Norman is going on an adventure in the book? Joshua Sanabria is CEO of GoArchitect, an independent publisher of design and leadership books that foster curious and creative confidence. Josh lives in California and enjoys bringing architecture to life through sketching, writing, and creating software.